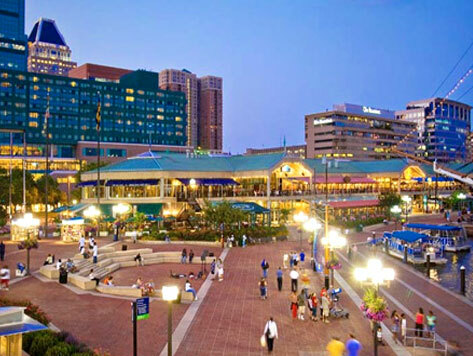 Harborplace is Baltimore’s premier destination for dining, shopping, and entertainment. Located along the Inner Harbor waterfront, the complex is composed of two buildings – the Pratt Street Pavilion and Light Street Pavilion, and contains dozens of stores and restaurants. Many of the stores sell Baltimore memorabilia and souvenirs, such as blue crab food products, Baltimore Orioles and Ravens merchandise, Edgar Allen Poe products, and University of Maryland items. Restaurants and retailers include Bubba Gump Shrimp Company, the Cheesecake Factory, H&M, Johnny Rockets, McCormick World of Flavors, Ripley’s Believe It or Not! Baltimore, Uno Chicago Grill, and Urban Outfitters. The marketplace is just steps away from popular Inner Harbor attractions including the National Aquarium, Baltimore World Trade Center, Top of the World Observatory, Historic Ships in Baltimore, and Power Plant Live.